Thừa Thiên-Huế ( listen) is a province in the North Central Coast region of Vietnam, approximately in the centre of the country. It borders Quảng Trị Province to the north and Đà Nẵng to the south, Laos to the west and the East Sea to the east. The province has 128 km of coastline, 22,000 ha of lagoons and over 200,000 ha of forest. There is an extensive complex of imperial tombs and temples in Huế. The region's history dates back some 2,800 years according to archaeological findings from the Sa Huynh Culture as well as from relics in the region. Đại Việt became an independent nation around 938 BC of which territorial conflict lasts for about four centuries between the Đại Việt and the Champa. The two provinces then changed their names to Thanh and Hóa. In 1307, Đoàn Nhữ Hài was appointed by the king, Trần Anh Tông, to administer the area. The people from the north (Thanh Hóa) migrated south and integrated with the people of the Kingdom of Champa. During this time, had the settlement of Hoa Chau Province began, which included the area of present-day Thừa Thiên. Between the settlement of Thuận Hóa (1306) to the founding of Phú Xuân (1687), there were conflicts and uncertainties for the local people, which including the fall of the Trần Dynasty to the renaissance of the Hồ dynasty. Thuận Hóa and Phú Xuân became the location of the Đại Việt kingdom once Nguyễn Hoàng was appointed head of Thuận Hóa (1511–1558). Lord Nguyễn Hoàng (1558–1613) established bases at Ai Tu, Tra Bat and Dinh Cat, while his lords moved palaces to Kim Long (1636), where they would eventually base their operations in Phú Xuân (1687). The Nguyễn lords ruled the area until it taken over the Trinh clan in 1775. The farmers movement led by the Tây Sơn brothers gained momentum in 1771. The Tây Sơn insurgent army won the battle in Phú Xuân to take over the Nguyễn capital in 1786, where they continued north and overthrew the Trinh Dynasty. In Phú Xuân, Nguyễn Huế appointed himself king, and with internal differences with the Tây Sơn Movement and the death of Nguyễn Huế (1792), Nguyễn Ánh took advantage of the situation and took over Gia Định with the support of foreign forces. Nguyễn Huế attached to the Tây Sơn movement and took over Phú Xuân and the throne, thereby choosing the dynasty title of Gia Long (1802). Phú Xuân was again chosen as the capital of Vietnam until 1945's August Revolution. Prior to 1975, the province was known simply as Thừa Thiên. The province is known as an area of heavy fighting during the Vietnam War, as it was the second-most northerly province of the Republic of Vietnam, close to the North Vietnamese border (DMZ) at the 17th parallel. More U.S. soldiers died in this province than in any other province in Vietnam (2,893). The Massacre at Huế occurred here; an estimated 2800 to 6000 civilians and Army of the Republic of Vietnam (ARVN) prisoners of war (POWs) were slaughtered by the Việt Cộng. Thừa Thiên-Huế province saw a large influx of North Vietnamese settlers soon after the Vietnam War ended, as with the rest of the former South. This province and neighbouring Quảng Nam Province suffered greatly from flooding in November 1999. Thừa Thiên-Huế Province borders Quảng Trị Province to the north, the city of Đà Nẵng to the east, Quảng Nam Province to the south, and the Savannakhet, Salavan and Sekong provinces of Laos to the west. The Perfume River (called Sông Hương or Hương Giang in Vietnamese) passes through the province. The province also accommodates the Tam Giang-Cầu Hai Lagoon, the largest lagoon in Southeast Asia, which has 68 km in length with 22,000ha of water surface. The province comprises four different zones: a mountainous area, hills, plains and lagoons separated from the sea by sandbanks. It has 128 km of beaches. The mountains, covering more than half the total surface of the province, are along the west and southwest border of the province, their height varying from 500 to 1480 metres. The hills are lower, between 20 and 200 metres, with some points at 400 metres, and occupy about a third of the province's area, between the mountains and the plains. The plains account for about a tenth of the surface area, with a height of only up to 20 metres above sea level. Between the hills are the lagoons which occupy the remaining 5% of the province's surface area. Bạch Mã National Park is a protected area in central Vietnam, near the city of Hué. It covers 220 km² and comprises three zones: a strictly protected core area, an administrative area and a buffer zone. The climate is similar to central Vietnam in general: a tropical monsoon climate. In the plains and in the hills, the average annual temperature is 25 °C, but in the mountains only 21 °C (statistical yearbook 2004). The cool season is from November to March with cold northeasterly winds. The lowest average monthly temperature is in January: 20 °C. In the cool season temperatures can fall to 12 °C in the plains and the relative humidity is high, between 85 and 95 percent. Then follows a warmer period from April to September with average monthly temperatures up to 29 °C in July, reaching up to 41 °C at times. It is very humid in July but relative humidity is lower, sometimes down to 50 percent. The annual precipitation in the province is 3200 mm but there are important variations. Depending on the year the annual average may be 2500 to 3500 mm in the plains and 3000 to 4500 mm in the mountains. In some years the rainfall may be much higher and reach more than 5000 mm in the mountains. The rainy season is from September to December—about 70 percent of the precipitation occurring in those months. Rainfall often occurs in short heavy bursts which can cause flooding and erosion, with serious social, economic and environmental consequences. The floods of November 1999 led to 600 deaths and affected 600,000 homes. (Comité des inondations, 1999). A remote region known as the "Green Corridor" is home to many species. New species of snake, butterfly, and orchid have been found there in 2005 and 2006, as stated by Chris Dickinson of the World Wide Fund for Nature (WWF) on 26 September 2007. The scientists discovered 11 new species of plants and animals, including a snake, two butterflies and five leafless orchid varieties. The new snake species is a white-lipped keelback (Amphiesma leucomystax). The new butterfly species are the "skipper" from the genus Zela and the other from Satyrinae. The new plant species also include one in the Aspidistra family, and a poisonous Arum perennial. Schoolchildren are required to wear uniforms and "khăn quàng đỏ" (red neck tie) to school. The "khăn quàng đỏ" is mandatory for all elementary students in Vietnam, symbolizing their allegiance and adherence to the Communist Party and its ideologies. High school girls are required to wear white áo dài to school, while boys wear uniforms consisting of a white shirt and dark blue pants. They are further subdivided into 8 commune-level towns (or townlets), 105 communes, and 39 wards. The average population of the province is 1,088,700, which consist of approximately 538,100 males and 550,600 females. The rural population is approximately 393,000 while the urban population is 695,700 (2009). The retail sales of goods and services (trade, hotel, restaurant, tourism) in the province is 10960.6 billion đồng or 0.9 percent of the country. This is compared with 12.7 percent for Hanoi and 23.5 percent for Ho Chi Minh City (2009). The province has more than 120 km of coastline, which provides for a seafood industry that produces over 40,000 tonnes/year consisting of over 500 species of fish. There are more than 100 mines for minerals and non-mineral resources with the majority consisting of limestone, granite and kaolin. Arts (e.g. wood works, fabrics, furnitures, paper arts, pottery), literature (text books), and spicy cuisines (included dry goods, vegetarian food) are the main exports of this region. Exquisite custom-made áo dài (Vietnamese long dress), and nón lá (conical hat) are souvenir items for foreign visitors and overseas Vietnamese. The ability to make toys, design lanterns, form special papers, and figurine-making are native skills. Such fruits as rambutan, jackfruit, lychee, durian, dao, dragon fruit, star fruit, mangosteen, coconut, and kumquat are grown in this area due to sufficient amount of rain received each year. 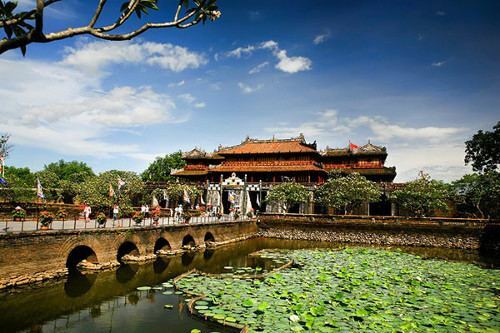 Many historical buildings are located in Huế, largely a legacy from its time as a capital of the Nguyễn dynasty (1802–1945), including the Royal Citadel, the Flag Tower, the Royal Palace, and the Royal Tombs. Huế's Forbidden Purple City was once reserved for the royal family, but was severely damaged during the Vietnam War. Outside the city is the religious site known as Nam Giao Hill ("Heaven's Altar"). Hue Brewery Ltd is located on Hương Giang in Huế with a recognizable brand in central Vietnam. The Brewery is jointed owned by the state and private sector and was founded in 1990 with an initial investment of 2.4 million USD with a capacity of 3 million liters/year, which has grown to a capacity of 100 million liters/year in 2007. Vietnam's National Route 1A, which runs the entire length of the nation from north to south, passes through Huế. Huế and Đà Nẵng are the main intermediate stops on the railway line from Hanoi to Ho Chi Minh City. This province is served by two sea ports: Thuan An Port and Chân Mây Port. Phu Bai International Airport, the largest domestic airport in terms of passengers per year is situated 15 km south of Huế. This airport ranks fourth among Vietnam's airports. The government has approved the upgrade of this airport to an international airport with some air links inside Asia. This city is home to Huế University (e.g. : Huế Economic University, Huế Medicine University, Huế Pedagogical University, Huế Forestry and Agriculture University, Huế University of Sciences, Huế University of Arts, Huế Conservatory of Music and Huế College of Foreign Languages). As of 2009 the province had 190 schools, 1302 classrooms, 2184 teachers and 36,200 pupils. The province's name derives from Sino-Vietnamese 承天–化.